The World Council of Credit Unions concluded its study trip to Australia after a week of robust discussion and collaboration with Australia’s financial cooperatives. League President/CEO Todd Mason was part of the U.S. delegation that traveled abroad. 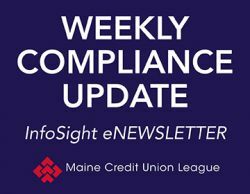 The League extends our congratulations to Maine State CU’s Bruce Harrington. On April 25, Bruce will receive the Elias A. Joseph Award at the Mid-Maine Chamber of Commerce’s annual awards ceremony. The award recognizes Bruce’s volunteerism, professional achievement, and devotion to his community. 80% of our credit unions are registered to attend the 2019 Annual Meeting and Convention. Don’t miss your chance to attend this year’s event. The registration deadline is today! On April 17, the League testified before the Legislature’s Committee on Judiciary in opposition to L.D. 1053, “An Act To Reduce the Period of Enforcement for Judgments Based upon Consumer Obligations.” The bill would reduce the amount of time a judgment from a court is enforceable from twenty years to one. NorState FCU is proud to announce its support of Madawaska’s Music in the Park series. This popular summer event, newly named “NorState’s Music in the Park,” will be held every Thursday evening beginning mid-June through September. The UMaine Business Challenge, presented by Business Lending Solutions, awarded $16,000 in cash and prizes to collegiate entrepreneurs last weekend at the University of Maine in Orono. In honor of CU Youth Month, Jake Holmes, the League’s Financial Outreach Coordinator, discusses the benefits of speaking with children about money in his latest financial literacy blog. With fewer people visiting branches, credit unions are looking for ways to make their locations more relevant. Branch designs and employee interactions with members are evolving to meet this need.